Khan, a research scientist working with Dr. Sharon Doty’s plant microbiology lab, studies bacterial endophytes, which are naturally occurring microbes that live inside plants. They help plants grow by enhancing root production and thus increasing the ability to capture water and nutrients. They can also improve resistance to and tolerance of stressors like high or low temperatures, salinity, pollution, and drought. Khan is focusing on endophytes that will help poplar trees when water is limited. As a member of the AHB feedstock team, Khan is running experiments to better understand the effects these particular endophytes have on hybrid poplar grown on short rotations for bioenergy. Khan ran a drought tolerance study using hybrid poplar cuttings provided by GreenWood Resources, Inc. She inoculated the cuttings with an assortment of endophytes collected from poplar and willow trees in the wild and grew them in water. Right away she could see that the inoculated plants had greater root biomass and a higher survival rate. 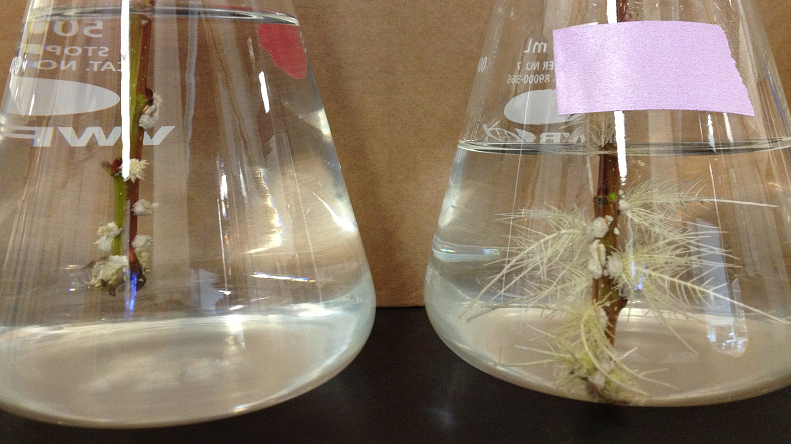 Poplar cutting root growth in the control group (left) and inoculated with endophytes (right). Photo by Zareen Khan. The rooted cuttings were then planted in soil and subjected to drought-like conditions. After one month of withholding water, Kahn saw dramatic results. The poplars inoculated with the endophytes had more biomass, retained more moisture, were greener, and had more roots than the non-inoculated plants in the control group. Total nitrogen in the roots of inoculated plants also increased, indicating that the added endophytes helped improve nutrient acquisition by the poplar plants. A control group of poplar plants after one month without water. Photo by Zareen Khan. 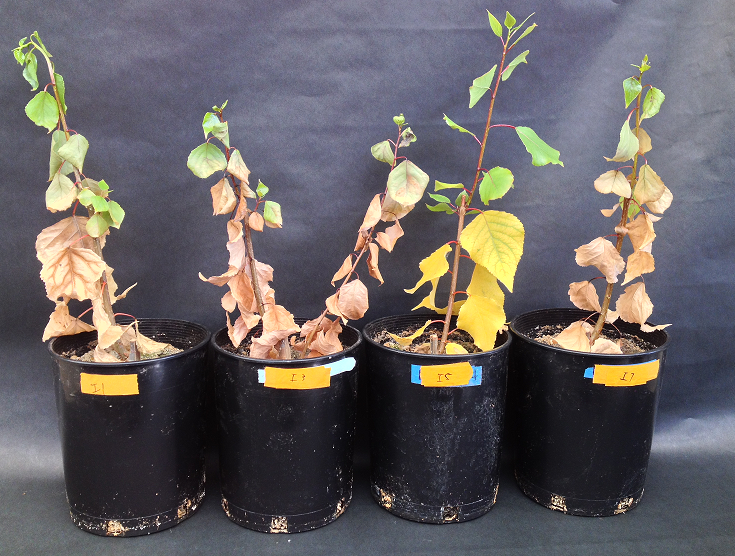 Poplar plants inoculated with endophytes after one month without water. Photo by Zareen Khan. A common result of stress-induced metabolic imbalances is an increase in molecules called reactive oxygen species (ROS). 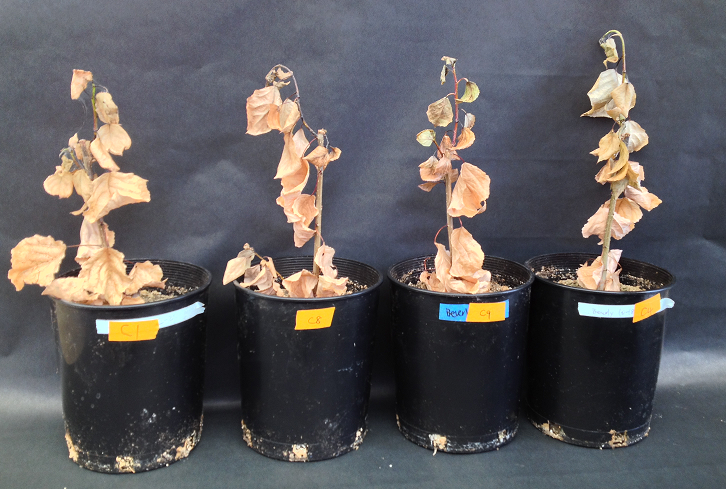 However, under drought stress ROS activity decreased in the endophyte-colonized plants, indicating that endophytes play a critical role in conferring drought tolerance at the cellular level. The endophytes selected for this study produce plant growth hormones which may also influence the plant’s performance under stressful soil conditions. Kahn also suspects the endophytes may help in reducing the photosynthetic stress. Solving that mystery is what keeps Khan fascinated with endophyte research. Understanding how the endophytes work will be important for maximizing efficiency in poplar production. Her next experiment will evaluate how quickly poplars inoculated with endophytes recover from drought once they are saturated with water. Khan also plans to conduct field trials to find out if her discoveries in the laboratory and greenhouse hold up in field conditions.